Silver has a long tradition of being Nature’s Antibiotic. Free-Mart Crystalline Silver is unlike any other silver solution. Unlike patent drugs, disease causing microbes cannot develop an immunity to Silver, which is known to kill all viruses, bacteria, yeast, mold and fungus. However, not all silver products are created equally and Free-Mart Crystalline Silver is in a class by itself! Most people agree that when dealing with infections such as strep throat or pink eye, that they don’t want to wait for days to get on top of the infection. They want results and they want them fast, even if it cost a few pennies more! Positive and poison come from the same root word. Anything that has a positive charge is poisonous to the human body. Any substance with a positive polarity is repelled from the cell opening and because Free-Mart Silver is negatively charged, it will be attracted inside of the cell where it can kill pathogens in the remotest parts of the body. Understanding this fact, many scientists have attempted to create a silver solution that is negatively charged and only one so far has been successful. That is the inventor of the Free-Mart Crystalline Silver. Each Crystalline Silver particle found in our silver solution is bound to a Hydrogen Ion, which has a negative electrical charge. Therefore when it is presented at the cell opening it is virtually sucked inside of the cell similar to the opposite poles of a magnet. This fact alone sets Free-Mart Crystalline Silver apart from all other silver solutions and puts it in a class by itself. 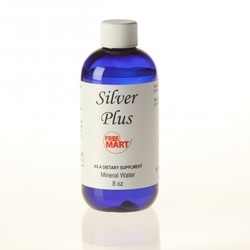 The silver particles in Free-Mart Crystalline Silver solution are in a crystalline form. These are sometimes referred to as mineral salts. Mineral salts are the purest form of minerals and they are the safest form for human consumption. They also assimilate faster than any other form of mineral. You can therefore expect the fastest possible results when taking a mineral in this isoform as opposed to a metallic mineral. Crystalline silver particles are also non-toxic, making Free-Mart the safe alternative to other silver solutions. The word ionic indicates that a given mineral solution was made using electricity to dissolve or separate the mineral particles using a process known as ionization. Although it is manufactured in a much different way than other ionic solutions, Free-Mart Crystalline Silver is ionic, making it totally unique from all other silver products whether they are ionic or not. Silver solutions are typically measured in parts per million (PPM) using a TDS (Total Dissolved Solids) Meter. What only a few people understand is the fact that a TDS Meter obtains its reading based upon the “impurities” in the silver. Free-Mart Crystalline Silver is so pure (99.999999+) that it does not test accurately with a cheap TDS meter. You need an expensive Spectrograph that costs $1,000 plus in order to get an accurate reading. This expensive machine actually reads conductivity and converts the reading to TDS or PPM. Perhaps the most popular concentration for silver solutions is 10 PPM. Some people have said that you should never go above this concentration. That is probably true with other silver products because even too much nano sized “metallic” silver can be toxic and turn your skin blue. Even at this extremely low dilution (10 PPM), you may see benefits, although there will be extreme distances (on the microscopic level) between the silver particles in this weakened dilution. Therefore, the kill-rate of disease-causing microbes with Free-Mart Crystalline Silver could easily be 200 times greater against bacteria, viruses, yeast, mold, fungus and some parasites, including the parasite that causes Malaria. At 2,000 TDS, one bottle of Crystalline Silver would be equivalent to 200 bottles of another brand of silver at 10 TDS dilution. Here is an exact comparison with one of the best silver products available. There is another mlm company that sells a diluted form of our silver solution. Free-Mart Crystalline Silver has a concentration of 2000 TDS and our competitor has a watered down version measuring 25 TDS, which they sell for $25 per bottle. Consumers of this watered down product are paying $1 per 1 TDS. If we were to sell our Crystalline Silver for $1 per TDS, it would cost you $2,000 for one bottle of our silver. In other words, you would have to buy 80 bottles of this inferior product at a cost of $2,000 ($25 each) to equal the same amount of silver particles found in one bottle of Free-Mart Crystalline Silver. In addition, you would have to pay shipping on 80 bottles of water, so if you want a diluted version of our product, simply buy one bottle of Free-Mart Silver and add it to 79 bottles of distilled water and your savings will be $1,958 plus the cost of shipping an extra 79 bottles of water. Free-Mart Crystalline Silver is in our humble opinion not only the “best” silver product that money can buy, but it is safe for even the youngest and the sickest of people. It is so pure that you could drink a whole bottle without it hurting you. Free-Mart Crystalline Silver may be your best choice for preventing or stopping the spread of dangerous micro-organisms. For all of the reasons mentioned above, Free-Mart Crystalline Silver should be your choice when choosing a Silver Solution. For maintenance, take 1-2 caps-full of Crystalline Silver 2-3 times weekly. For chronic or acute microbial infections, take 1-3 caps-full 3x daily directly in the mouth or apply topically as often as needed for cuts, burns, abrasions or for any skin eruptions. AL Huisman (verified owner) – February 14, 2016: Free-Mart Silver is Great and Works F-A-S-T! This is why I am giving it 5 Stars. No comparison to the other silvers on the market that I have tried in the past. Free-Mart Silver will always be a Great Addition to my Medicine Cabinet and one that I never will ever want to be without and always have on hand. Thank You Free-Mart for another Great Product! – AL Huisman – Indiana. Don Chadwick – March 23, 2016: I had a crown come off and my Dentist prescribed an antibiotic because the tooth was abscessed. He then advised me to have a root canal at a cost of $4000, but with no insurance I elected to think about it awhile. After 4 weeks the abscess started getting worse. I ordered some Free-Mart Silver and when it arrived, I started taking two capfuls 3 X day – holding in my mouth at least 10 minutes before swallowing. After just 3 days I could tell it was getting better and all pain was gone in 8 days! It has been 7 weeks now and no problems at all and I never filled the prescription for antibiotic. Great Product! Sonja Stone – April 8, 2016: I can say with 100% certainty that this product saved the life of my beautiful and very beloved German Shepherd. He was dying from all the pesticides and other toxic materials that are carried onto my property by the strong winds that we sometimes have, and since we have never been poisoned by the wind in 20 years of being here, I can only assume its probably coming from the surrounding farms. All I know is that after 20 years spent growing a beautiful green desert oasis, suddenly my trees began dying. And then, one by one, all of my many pets died inexplicably, and then I became ill, which is extremely unusual for me, and so did my last pet, i.e., my German Shepherd. I was in probably the last stages of cancer because I was much too thin, and unable to gain an ounce of weight no matter how much I ate, which is also unusual for me. I just thank God everyday that I made contact with John Austin when I did, because as dramatic as it may sound to say, I also know with 100% certainty that if I hadn’t, I wouldn’t be here. The Silver changed everything for me and for my sweet pet. I gave him a teaspoon of it in some chicken broth, (his favorite lol) and continued to do that every single day until I was sure he was well. When I began he could barely lift his head to lap up the broth, but the very next day I could see a marked improvement in him. For one thing, he was able to stand up and walk. On the third day he was back to his rambunctious self again. There is no way to thank John and David and everyone who is putting this remarkable one of kind company together. I am just grateful and honored to be a part of it. A 5 star product? I should say so!! !